Guduchi, Guggul, Amla, Harad, Baheda, Dantimool, Trikatu, Vividang, Giloy, Trifla, Dalchini, Nishoth. An excellent remedy for gout and arthritis, hyper uricemia (an excess of uric acid in blood causes pain, inflammation and swelling of joints and limbs). 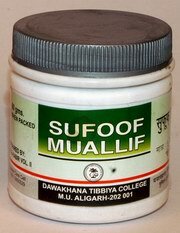 Also useful in treating water retention, rhuematoid arthritis, hepatitis, loss of appetite, piles and fissures. 2 - 2 Tablets twice a day with water. Naushadar, Namak Toaam, Namak Siyah, Namak Lahori, Suhaga Biryan, Narkachoor, Halela Siyah, Post Halela Zard, Post Halela Kabuli, Baobarang, Filfil Siyah, Zanjabeel. It is recommended in hepatitis, enlargement of Liver. Beneficial in constipation and acts as an carminative. 2 Pills twice daily after meals or 4 Pills once a day at bed time. Children may be given half to one pill according to their age.